I am looking as a first project after some simple project kits, to make a watering system for my indoor plants. I have seen a few projects on instructables, so I went to look for components. I am not sure how to power the pump from the Arduino. A bucket of water with a water pump inside. An irrigation system linked to the pump, which then goes to all the plants. The pump linked to arduino which turns it on and off based on a timer. Also I guess I will need some tube to connect the pump to the watering kit. I am not sure how to connect and power the pump (12V) with the arduino. The arduino it self will be powered by a USB on a wall socket. I have some details about running motors etc. from Arduino pins at Driving motors, lights, etc. from an Arduino output pin. 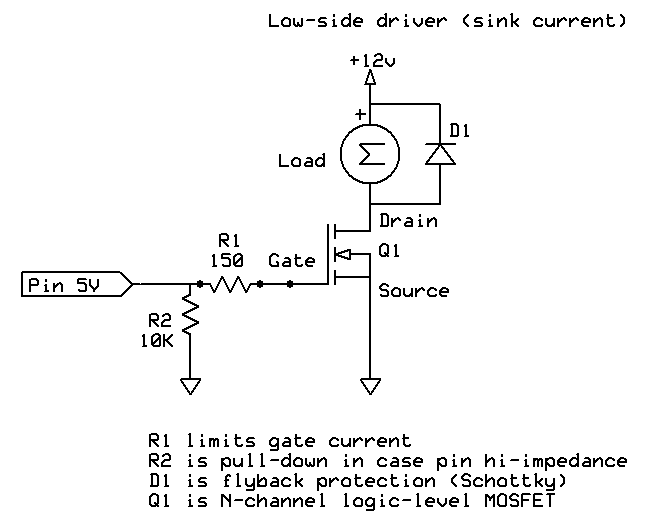 In this case you connect the positive side of your 12V supply for your pump to the pump, and the MOSFET sinks current to ground, when you require the pump on. Don't forget the diode D1 which prevents damage from the inductive load of the pump generating high-voltage spikes. Not the answer you're looking for? Browse other questions tagged arduino-uno motor voltage-level or ask your own question. How many sensors can be supported by a single Arduino unit? Is a solenoid piston strong enough to lock a water tubling? What components do I need to build Arduino based water pump controller?